Want to get involved with River North’s biggest party of the year? We want you! 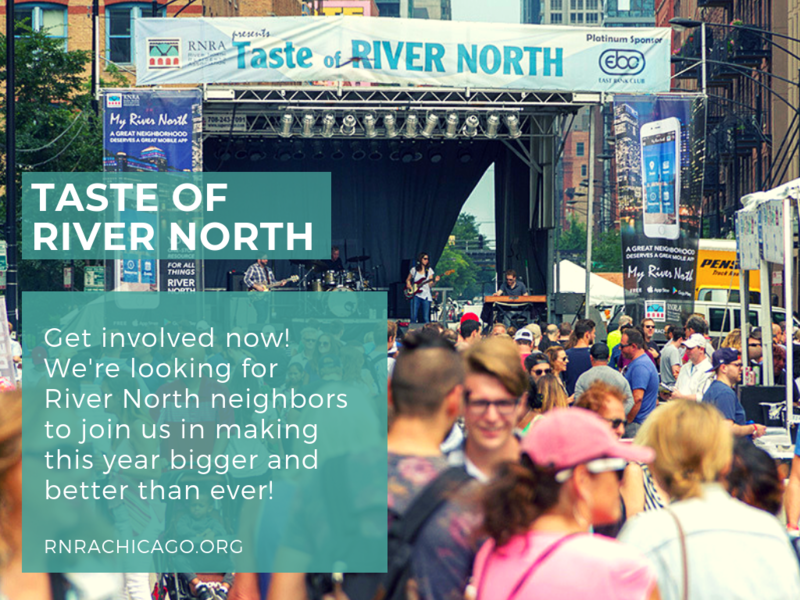 We are looking for River North neighbors to join us in making Taste of River North better than ever! From children’s programming, dog events, fun on the river walk, music performances, and much more – we welcome you to help us create the best event yet. Interested? Please submit the volunteer application below. Once we receive your application we’ll be back in touch. Thank you for you interest in volunteering for the Taste of River North and for taking the time to complete this form. RNRA never shares personal information externally without permission. The Taste of River North, takes place for an 18th consecutive season, July 19 – 21 at Kingsbury & Erie and Montgomery Ward Park. Presented by the River North Residents Association, the festival will include attractions like an Art & Wine Walk along with non-stop live music, delicious food from local restaurants, a kid’s activity area, a dog-friendly activity area, local artisans and merchants, and morning exercises to prep the body for the River North good life.